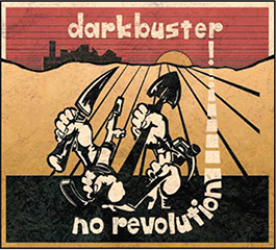 Well, with all the news about Boston punk/ska heroes Darkbuster making their triumphant return via a number of sold-out shows this week, the announcement of a new album acts as icing on a cake. The band’s third album, titled No Revolution, will be released this Friday (with a vinyl release September 4th), as Dying Scene reports. The ten track album is being put out by Pirates Press Records, who describe it as “a record that can be loved and appreciated equally by a fourty-something [sic] who knows every single classic Darkbuster tune and has seen them a hundred times, or a fresh-cut teenager who hears them for the first time”. No Revolution will be the band’s first since 2005’s A Weakness For Spirits, though a listen to early lead single “No Fear” makes it seem like the band never stopped releasing new music. That’s the cover art up above (via Dying Scene), and be sure to check out the tracklist below. And just like that, Boston has again reached Peak Darkbuster: before playing two sold out shows at The Sinclair in Cambridge last night and tonight, the band played a “secret” show Sunday night at Great Scott in Allston as “P. Diddler and the Fearsome Foursome”. For those joining us in fetal-position floor sobbing because they were unable to get tickets, Dying Scene have a review of the show available on their site, and Youtuber AtheistPeace69 managed to document most of the set on his channel. Check out some of the set’s highlights below. Darkbuster play The Sinclair tonight with The Have Nots, The Scandals and Burning Streets, and then again this Friday in Portland, Maine with El Grande, The Outsiders, and Roots Rhythm and Dub (tickets are still available!) and the following night in Pawtucket, Rhode Island with Reason To Fight, The Down and Outs, and The Worried. Check out our Boston Ska Event Calendar for more upcoming events in the area.